List of jam nights around the North West. - The Oaks Ramsbottom - 1st and 3rd Sunday of the month 4pm start -if football doesn't interfere! - The Swinging Arm, Birkenhead, 8.30pm. - Dray King, Hindley, 8:00pm. - The halfway house, pemberton, wigan. - The Slow n Easy, lostock, Northwich. 8:30. Full kit, any type of music. - Java Bar in St Helens, 9pm (Acoustic) Guitar provided + a free drink with headline acts from 10pm. - Ship and Giggles, 3 Fylde Road, Preston, Lancashire PR1 2XQ, from 10.00PM after live band. Any more additions? Just comment the day, pub, town, time and genre and I'll update it, cheers! Other comments or reviews also welcome. Also, please double check with venue before going as I'm not always told when stuff get's out of date. very usefull and informative blog, .good to see this one pinned. Very much a musicans' jam night as opposed to a band open mic (although bands are welcome to play together if they wish). The people who attend this jam night are largely those who want to jam in it's truest form ie get up with musicians they've never played with before making it up as they go. Usually very blues/jazz/funk oriented. 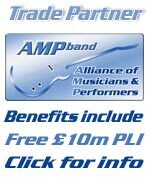 All backline supplied (inc very good quality drum kit). Most weeks the house band is comprised of professional musicians. Thanks for the updates, no shortage of jam nights on Thursdays then! Acoustic jam night with electronic kit, bass and 2 guitars every Thursday: The Victoria, Quarry St, Woolton, Liverpool. 9.30-midnight. Both hosted by Tribute acoustic trio. Hi folks, my son is 16 years old, just finished school and starting college in September, he is a drummer currently studying grade 6. My question is: would he be OK to attend a Jam night? Obviously he would not be drinking alcohol, and would be accompannied by me, but I am not sure of the licensing laws? Any comments or tips on how he can get into a band would be appreciated. Licensing law = if he is 16 he can go in a pub on his own (if management allow) but can't buy or drink alcohol or play the gaming machine and must leave by midnight. If accompanied by an adult then the midnight curfew does not apply. ps Management policy in my pub is that under 18's are only allowed when accompanied by a mature adult. How late they can stay depends on what's on. There's no restriction on jam nights but alas ours is acoustic style. Percussion etc but no drum kit. @ Markludd - the jam at the Stanley in Accrington every Monday night and the one at the Dog Inn in Whalley (first Thurs of every month) are particularly welcoming to young players. I've been taking drum students as young as 9 to the Stanley for over 2 years and they are always greeted like heroes and encouraged to get up and play. There's a young lad who goes to almost every jam and plays guitar in the style of Hank Marvin and he's come on in leaps and bounds in the company of experienced players (he was excellent to start with but his bandsmanship skills have shown a marked improvement). I think he's about 13. That's great news, thanks :) We will come along to those in the next couple of weeks. Hopefully see you there. We are having a regular on in the Bowling Green, Horwich, on the first Tuesday of every month. Next one is 7th. August - 8.00 pm start ...... but it is acoustic only!! First one last month was amazing, some real good talent out there!! hi, we have a 13 year old electric guitarist and a 9 year old double bass, they come to our Open Mic Night... Any age welcome :-) next OMN is Thursday 2nd August 9pm onwards, otherwise first Thursday of the month. Thanks for the updates, no shortage of nights to choose from! Just heard that The Guzzling Goose is closing down, not sure now true it is though. Thanks for the updates, a few reviews of these nights would be good, anyone? sunday nights... curry club (jam night but we order a takeaway), live music, booze, pizza/kebab/curry... best sunday night in town ! The Rendezvous, St Helens, every Wednesday 9.30 onwards, all abilities and styles welcome. Hi my name is Reece ive been going to jam nights at the Stanley at accrington and dog in whalley since i was 12 i was very shy at 1st now 18mths down the line it has given me more confidence Thanks to all the professional musicians who have helped me along the way. Jam Nights Rock! Few more updates posted, we're now up to 45 jam nights per week to choose from! Keep 'um coming folks, and don't forget to post the address too! Cheers, Will. CIDER 'OUSE JAM NITE every 1st + 3rd Wednesday of the month. Ye olde man & Scythe, 6 - 8 Churchgate, Bolton, BL1 1HL. All welcome, bring your own instrument and join in the fun. 2nd SUNDAY of the month Acoustic Jam @ Peels Arms, 143 Den Lane, Springhead, Oldham. OL4 4RE. EVERY TUES Acoustic Jam @ Delph Club, Gartside Street, Delph, Oldham. OL3 5DW. EVERY WEDS Acoustic Jam @ The Dog & Partridge, 187 Oldham Road, Springhead, Oldham. OL4 4QJ. 8:30pm hosted by Stelly. EVERY THURS Acoustic Jam @ The Granby, 28 High St Uppermill, Lancashire County OL3 6HR. Hiya, HOOCHIE COOCHIE MANcunian here. I've started a Jam night. It's every week on a Monday night, kicks off 8-30 to 9-ish. 400m from Heaton Park Metrolink Station. Bring your own guitar. We provide everything else including 2 Fender Princeton II (Rivera) all valve combos & boost pedals, kit and bass rig with left and right handed basses, an Ibanez semi with heavy strings and serves as an acoustic / jazz guitar, P.A. and monitor. I'm known for playing mainly Blues but anything goes which doesn't empty the pub! Boddies and Tetley's on handpumps. The Friendship finished months ago and The Bakers Vaults hosted by The Backwater Blues Band is also obsolete. Assheton Arms,Middleton town centre (at the roundabout bottom of Long St) Hosted by Touching Cloth & big Bri - all you need on backline - 2 gtrs,bass keys drums. all welcome. Thanks for the updates - one new but three down! Hopefully my new band will be doing one in 180 club (old conny club) leigh. Update here on the Oldham Jam Nights. Peels Arms - Springhead Monthly now CANCELLED! FIRST THURS Acoustic Jam @ The Granby, 28 High St Uppermill, Lancashire County OL3 6HR. 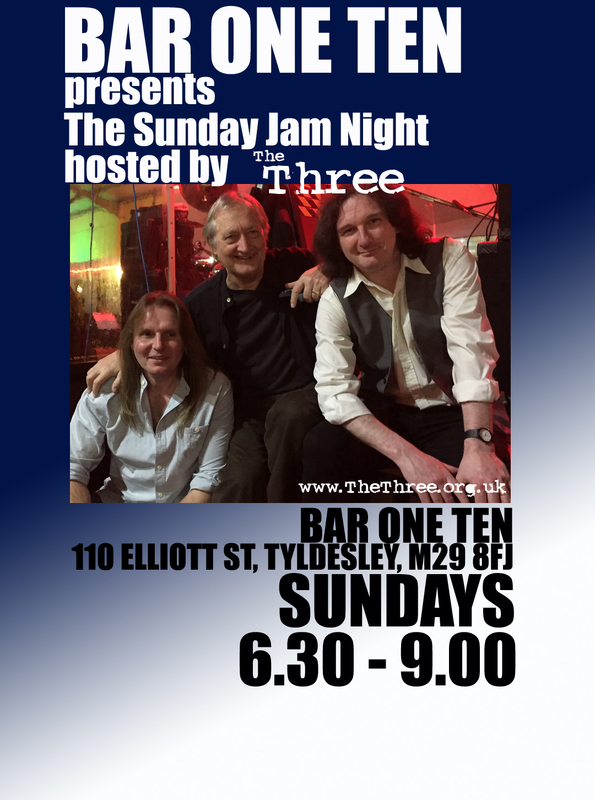 EVERY THURSDAY & SUNDAY Jam Night @ Jacksons Pit - Oldham - Hosted by Various! OL4 4LY Oldham hosted by The Sleeping Policemen. Acoustic open mic from 9pm - just turn up and play. Guitar provided + a free drink with headline acts from 10pm. Here are a few from the Southport area! Guzzlin goose shut down now! The Junction in Hulme, Manchester central south every Monday night is kind of for rockers with some reggae, every Wednesday night is reggae night. Tuesdays Assheton Arms jam no longer happening - moved to Carsons Bar,Townley St Middleton just round the corner. 3K P.A. miked up kit, back line provided, quality sound. Bring your own guitar / stix. Hosted by Dr Roxx, all styles and standards welcome. PA, backline, electronic drums and guitars provided. Hosted by Andy Smith from Alibi/Warble & Strum. Acoustic open mic/jam night with Jaie at The Saddle Pub, Liscard, Wirral EVERY MONDAY 9:30pm. Friday Night from 10.00PM after live band. Open Mic. does anyone know of one on this Sunday 11th October, preferably in the afternoon? The Oaks Ramsbottom - 1st and 3rd Sunday of the month 4pm start -if football doesn't interfere ! One of the best jam nights at the moment.